Run Azores is a unique running challenge located on the beautiful Portuguese island of Sao Miguel, the main island in the Azores archipelago in the North Atlantic. The challenge takes in four races on four consecutive days covering a total of 50K and is run over a mix of city streets, volcanic paths, lakeside routes and forest trails. But Run Azores is more than just a series of races, it's a chance to explore and experience these remarkable volcanic islands at ground level and enjoy a true running holiday with a difference. The Azores are a series of islands in the middle of the Atlantic, sitting midway between the continents of Europe and North America with Portugal 1360 km to the east, the nearest country and landmass. Although sailors had passed the islands for years, they weren't settled by the Portuguese until the 15th century. There are nine major Azorean islands and an islet cluster, in three main groups in the archipalego stretching to over 600 km from east to west. These are Flores and Corvo to the west, Carciiosa, Terceira, Sao Jorge, Pico and Falal in the centre and Sao Miguel, Santa Maria and the Formigas reef to the east. All the islands have volcanic origins although most have had no recorded activity since the islands were settled. Although it may not appear it at first sight, if measured from their base at the bottom of the ocean to their peaks the Azores actually has some of the tallest mountains on the planet with Mount Pico on the island of Pico standing as the highest point in Portugal, at 2,351 m (7,713 ft). The climate of the Azores is very mild for such a northerly location, being influenced by its distance from the continents and by the passing Gulf Stream. Due to the marine influence, temperatures remain mild year-round. Daytime temperatures normally fluctuate between 16 °C (61 °F) and 25 °C (77 °F) depending on season. Temperatures above 30 °C (86 °F) or below 3 °C (37 °F) are unknown in the major population centres and we would expect the temperature to be around 20 °C in September for Run Azores. One caveat with the weather is the potential for rain and cloud which are quite frequent visitors to the islands. 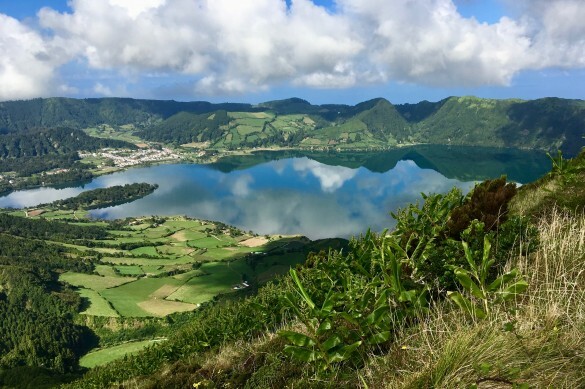 A number of major European and North American cities now have direct flights into the Azores with flight times ranging from three to five hours. Tourism is one of the key industries for the islands with tourists flocking to the Azores to experience the outdoor life, hiking and trekking in the hills, surfing and sailing around the coast or fishing and whale watching further off shore. 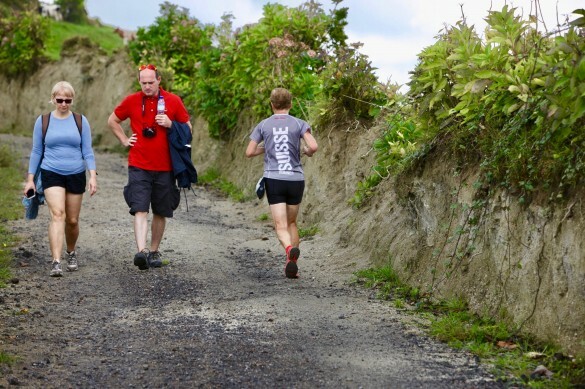 Although running is still in its infancy, a few of the islands have well established trail races aimed at the local population but Run Azores will be the first major international running event on Sao Miguel. Run Azores Challenge is a four-race concept over taking in four days and two different locations on the island of Sao Miguel. 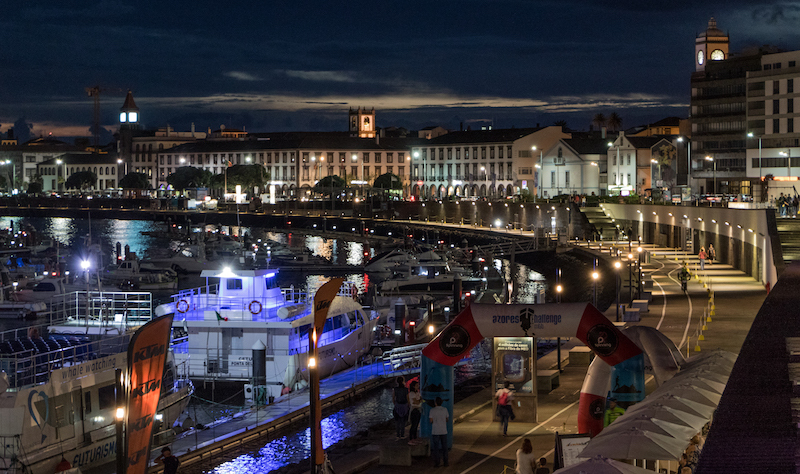 Monday September 16 - Ponta Delgada 5K This is a gentle introduction to your time in the Azores with an out-and-back 5K along the harbour side of Sao Miguel's capital city. We start early to beat the Monday morning crowds. It's a fast, flat course and afterwards you can feel the warmth of the gulf stream with a quick dip in the open air swimming area sheltered inside the harbour. Tuesday September 17 - Volcano Half Marathon You will struggle to find a more picturesque course than today's half marathon around the Sete Cidades lagoon, the huge crater in the midst of an extinct volcano on the west of the island. The route circles around the top rim of the volcano before descending down to the town at its centre and finishing beside the lagoon. Wednesday September 18 - Lakeside 6K After four days in Ponta Delgada the racing moves to Furnas a small town to the east of the island. Today's run starts beside the sulphurous thermal pools of Lagoa das Furnas. 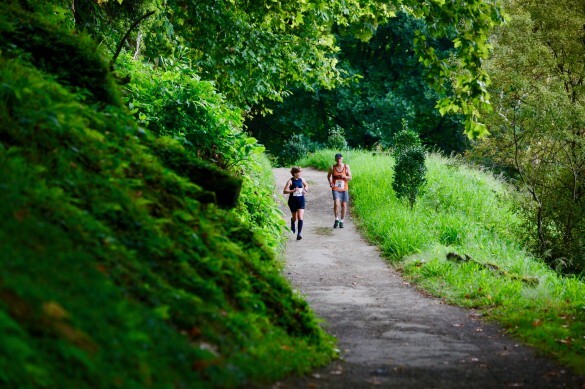 The 6.5K route circles the lake and its course is a mix of wooded dirt trail, road and cobblestone path. After the run you can chill out beside the lake or head into the town for a dip in Furnas's world-famous thermal pools and spas. Thursday September 19 - Serra Tronqueira 17K Your four-day running challenge finishes with another beauty: a point-to-point course along a secluded forest trail to the East of the island. The first five kilometres climb steadily upwards but then the course flattens and tips gently down for a long fast finish into the town of Nordeste. The majority of the route is run on hard packed dirt trails with the final few kilometres on the road. 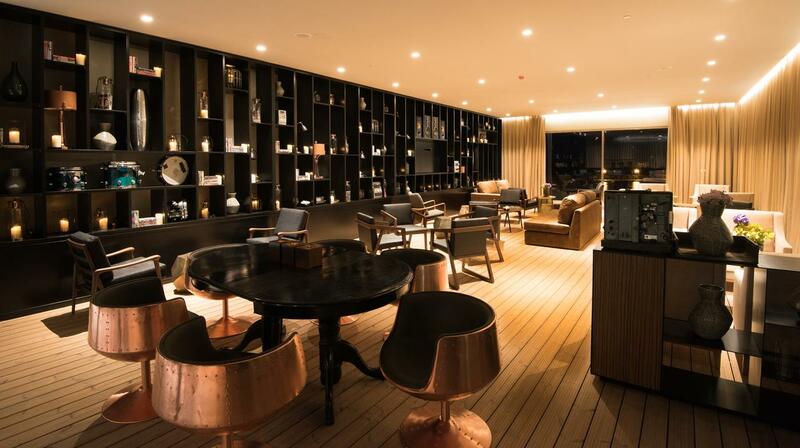 Your base throughout your seven-night stay will be the luxurious Hotel Azor which is located in the centre of Ponta Delgada, the largest town on the island of Sao Miguel. 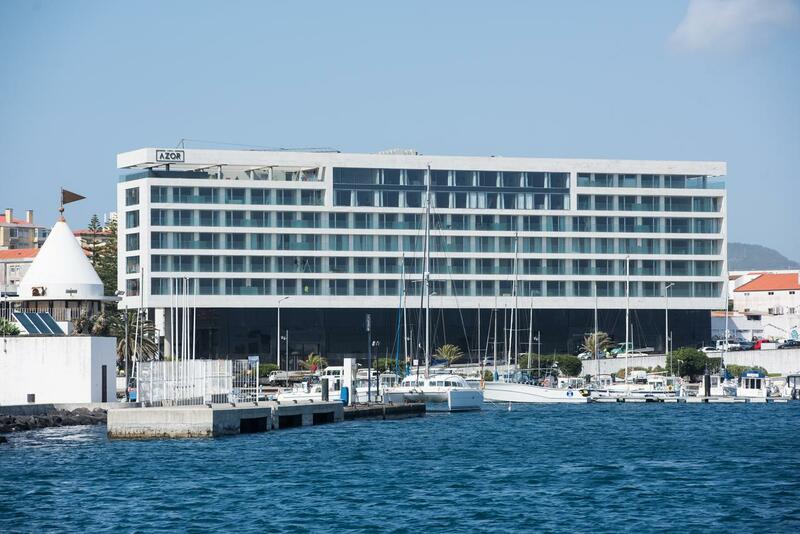 It’s a spacious, modern 5* hotel with 123 rooms, overlooking the marina and harbour and within easy walking distance of the restaurants and bars of the island's capital. An excellent daily buffet breakfast is included in your package and for those who still have the energy after racing, there is an an outdoor pool on the roof as well as spa and wellness centre. The Hotel Azor is 7km from the Ponta Delgada airport. Saturday 14th Sep: Arrive in Ponta Delgada (flights not included). Direct flights possible with Sata (Air Azores) direct from Gatwick, or Ryanair from Stansted. Other flight options available via Lisbon. On arrival take a taxi transfer (€7 per taxi - 10min journey) to the Azor Hotel. Sunday 15th Sep: Breakfast, day at leisure - optional activities include whale and dolphin watching, deep sea fishing, water sports. Briefing and race number distribution for the four races. 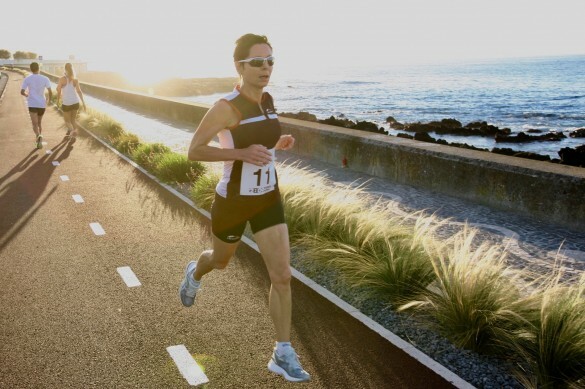 Monday 16th Sep: Ponta Delgada 5km. Breakfast. Day at leisure. Tuesday 17th Sep: Breakfast. Transfer by coach to Sete Cidades for the Volcano Half Marathon. After the run there is time to relax in Sete Cidades before we transfer back to Azor Hotel in the afternoon. Wednesday 18th Sep: After breakfast meet in reception and transfer by coach to the little spa town of Furnas. Our third race is a 6.5K run around the perimeter of Furnas hot springs and volcanic lake. After the run you can relax by the lake of stroll into the town itself to enjoy some wonderful hot springs and spas. Late aternoon, transfer back to Azor Hotel. Thursday 19th Sep: Breakfast. Transfer by coach to the start of the final race, the Serra Tronquiera 17km. After everyone is finished we will have a light lunch at the Tronquiera Restaurant then return to the Azor for a celebration dinner in the evening. Friday 20th Sep: Breakfast. Today at leisure for whale watching, fishing or walking along the rugged coastline. Overnight at Azor hotel. Saturday 21st Sep: Breakfast. Individual transfer to the airport for your return flight (taxi cost €7 - transfer time 10mins). Race day transportation for runners and supporters.